Whitewater is limited in Rhode Island, BUT the state has a few real gems, suitable for training, playboating and slalom training. An incredible whitewater resource, A half mile section offering 8 foot waterfall drop to gentle training waves, A staircase Class 3 drop that offer 3 play holes and waves depending on the level, the run is wooded and the water is clean, There is great park like parking area, with boat width trails leading to river, generally paddlers “Park and Play, either walking thru town a half mile or so up to Horsehoe Falls, paddling down from there or putting in at the top of the “Shannock Falls” and running over and over again. The river is fun down to 100 CFS on the Wood River JCT USGS Gage, It gets frisky at med levels 300 to 700 CFS with many fine surfing spots and pushy water, and above 700, its pure fun, a few big waves keep you busy all day long. This is the Upper Wood River, on Falls River Road. There is a parking area next to river. the river starts out with a solid Class 3+ series of jagged rocks, undercuts and shallow water to make for an exciting run, after the falls, continue thru swamp and look for outflow to the center left, from here the river gets quite amusing as she flows thru a tight river bed with a series of fun drops and nice scenery, watch for wood in here. You can run main falls over and over, if you chose to paddle to Austin Farm Road you will need a shuttle or walk back, this section runs in spring and after heavy rains, no true gage for this one, but if its spring and everything seems up, its probally a go. 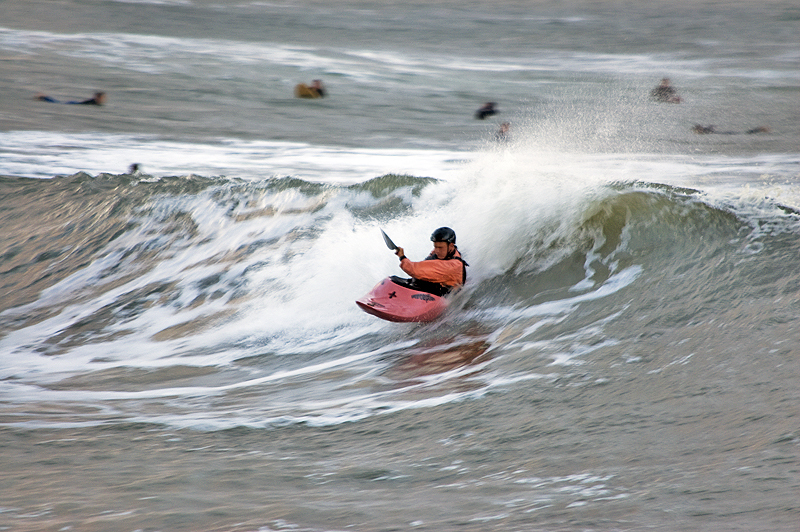 Ready for some Action Paddling antics? ?